TORONTO, CANADA - Tsodilo Resources Limited (TSX Venture Exchange: TSD) ("Tsodilo" or the "Company") is pleased to announce the results of a second independent Size Frequency Distribution (“SFD”) modelled grade and diamond value for the BK16 Large Diameter Drilling (“LDD”) aggregate 77.94 carat parcel of 502 commercial size (+1mm) diamonds initially reported on November 7, 2018. In early December 2018, Dr Paddy Lawless of PJL and Associates discovered that the size frequency model he utilized resulted in an overly optimistic projection of grade values. These results were presented in the Company’s press release on November 7, 2018. Given the potential significance of this error, the Company immediately retained the services of Mr. Stephen Coward of Interlaced to review and develop new model grade and valuation figures based on the same raw BK16 data. The approach included in-depth SFD modelling and simulation, and provides direct comparisons with comparable projects, the results of which are reported herein. The results of the prior press release are thus superseded with those contained in this press release. Given Mr. Cowards specific experience in the SFD modelling discipline the Company has accepted the results of Mr. Coward as definitive for the grade and value modelling of the BK16 deposit. Mr. Coward has over 30 years’ experience in the diamond industry, including over 20 years with De Beers, this experience has included work in project estimation, evaluation and value chain modeling across several commodities. Ranging from statistical and geostatistical modeling of diamond content, SFD and diamond value to project risk modelling. Mr. Coward's specific grade and diamond value modelling using SFD data includes work used in the writing up of De Beers assets for privatization and several subsequent empowerment transactions. More recently he has contributed to studies on both fissure and pipe bodies located in southern Africa and Australia. Mr. Coward is an expert in SFD modelling of grade and diamond value and is a "qualified person" as such term is defined in National Instrument 43-101. As previously reported by Tsodilo, modelling of drill hole data to 450m indicates a kimberlite tonnage of 18.2 to 20.1 million metric tonnes (Mt), this exploration target is described below. The LDD program produced 2,077 dry metric tonnes of sample from the VK2, VK3, VKxxx and CB lithological domains, which were treated to recover 502 diamonds (stones) weighing 77.94 carats (cts). To improve the confidence on both the grade and value a further phase of bulk sampling of BK16 would be required. Table 1. Summary comparison of Sampled, Published and Current Study Ranges for the BK16 deposit. Canadian National Instrument 43-101 - Standards of Disclosure for Mineral Projects, Form 43-101F1 and Companion Policy 43-101CP requires that the following disclosure be made: All references contained herein with respect to the potential quantity and grade derived by any method is at this stage of development is conceptual in nature. At the present time, there has been insufficient exploration to define a mineral resource and it is uncertain if further exploration will result in the target being delineated as a mineral resource. Further to this modeling of commercial grades is progressively more uncertain with smaller parcels of diamonds. It is important to note that the data presented here are global ranges of grade, diamond value, kimberlite value, and tonnage, and do not constitute a mineral resource estimate as the data have not been spatially modelled in any way. The objective is to derive global deposit scale (as opposed to per lithology or estimation domain) indications of potential value ranges for variables that can be used to inform additional sampling that will be required to evaluate this deposit. These values should be considered as aspirational projections, or targets for future exploration. 502 diamonds (weighing 77.94 carats) recovered from 3 parcels of commercial size diamonds (+1 mm) were analyzed by Mr. Ferraris at the Diamond Technology Park (“DTP”) in Gaborone after deep-cleaning by acid boiling and sized to the +1 DTC sieve classes. Mr. Ferraris determined current market values for the three LDD parcels as set forth in Table 2, utilizing the QTS proprietary Price-Book. Table 2. Details of the 3 parcels valued by Mr. Ferraris. The five highest individual diamonds constituting more than 4% of the value of the overall parcel ranged in size from 1.935 carats to 0.965 carats, weighed 7.220 carats in total and had an average market value of US$ 612.85 per carat, see Table 3. Table 3. The five highest individual diamonds constituting more than 4% of the value of the overall parcel. The chain of custody has been maintained to industry standards (see previous press releases describing the systems employed to ensure that industry standards were achieved). The diamonds were classified using the Diamond Trading Company (“DTC”) mass carater/grainer system for the 6, 5, 4 and 3 grainer size classes and the DTC Diamond Sieves (“DS”) for the -3gr+11, -11+09, -09+07, -07+05, -05+03, -03+01 and - 1DS size classes. The masses of all recovered stones were recorded and valued in their respective size classes. The valuation of these LDD diamonds is considerably higher than to those of the historical diamonds recovered in 1999 and 2000 from BK16, which were valued in 2016 at $138 per carat. More than half of the LDD diamonds were tested using a Yehunda Z-50 colorimeter and 3.8% of these were positively identified as Type IIa stones. Most of these are D color with one DE, one E and one F+ colors. Diamond breakage occurs both naturally during diamond emplacement or eruption of a kimberlite, and un-naturally during various processes of extraction, drilling and recovery of the diamond, which create “fresh” breakages. Natural breakages of diamond are subject to chemical attack from the molten kimberlite which would have etched or produced resorbed broken surfaces, making them recognizable as “old” or “natural” breakage. As such only “fresh” or un-natural breakage is contemplated during diamond breakage studies of this type. The diamond breakage data by Mr. Ferraris and Dr. Lawless are show in Table 5. Table 5. Breakage classification data for both Mr. Ferraris and Dr. Lawless for the BK16 LDD diamonds. The diamond breakage studies while not directly equivalent are similar enough to draw the following conclusions about the diamond breakage at BK16. They indicate a low level of un-natural or ‘fresh’ diamond breakages for the BK16 LDD diamonds. Most diamonds (68.5 to 69.7 %) were unbroken (zero breakage), and only 17.5 to 20.1 % were chipped. Breakage beyond this was limited to 11.4 to 12.7 %. This low level of fresh breakages illustrates the well managed LDD and dense media separation (“DMS”) plant treatment programs. The BK16 24-inch large diameter reverse flood air assist drilling (simplified to LDD) campaign is considered to be best practice and an industry standard for diamond project evaluation. The LDD tonnage estimate of 2,077 dry metric tonnes is based on the product of average domain density and the calipered volume of the drill holes from which the samples were extracted. Domain densities are derived from density measurements, made on cores from pilot holes that are twinned with the LDD holes. Diamond sample size is critical when assessing a kimberlite body as under sampling can give a dramatically skewed representation of the diamond distribution in a kimberlite. Review of sample $/ct to assess relationships between size and value. Obtain some indication of the plausible global range of recoverable in-situ kimberlite value in $/tonne from the diamond $/ct ranges and grade size distribution models. The diamonds have been individually valued and classified by assortment. The samples contain several high-quality Type IIa diamonds and the parcels have a substantial proportion of highly marketable shapes in the assortment. This information was used to develop estimates for the revenue that might be achieved for larger diamonds assuming the assortment in larger sizes reflects the quality of the assortment observed in the smaller size fractions. These models were applied to the size distribution models to produce a range of average $/ct values. Forward modelling of diamond reconstitution for breakage analysis by Mr. Coward using the diamond breakage data supplied by Mr. Ferraris and Dr. Lawless suggests that at most, reconstitution modelling may add ~6% by value to the recovered parcel, but when using a conventional reconstitution method, the difference is less than 2%. The impact of reconstitution was immaterial on the modelling of the SFD. Analysis of the values for stone concentration suggest good continuity and the associated grade uncertainty is considered low. Analysis of the size distribution of the diamonds recovered at BK16 indicates there may well be a coarse component to the distribution. Figure 1 shows the SFD modelling curves for the BK16 kimberlite (course = blue, and fine = purple). Included in Figure 1 is a direct comparison to the AK6 north lobe LDD (green) and production (gold) SFD curves, this was done as it became apparent that there was a similarity between BK16 and the AK6 north lobe SFD. Figure 1. 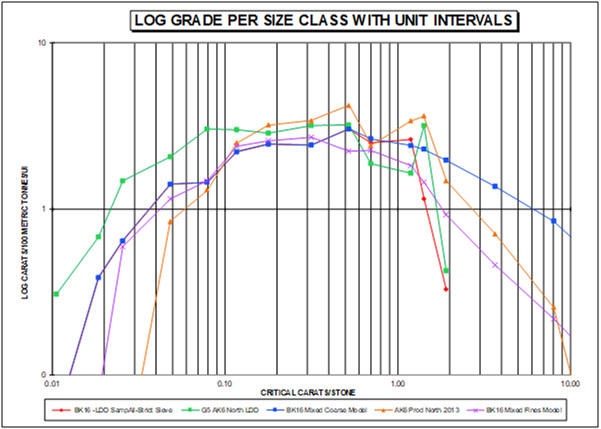 A plot of grade vs size for BK16 samples (Red) and AK6 samples at grade of 5 cpht (Green), as well as the BK16 coarse model (Blue), and the BK16 fine model (Purple), and AK6 North production (Orange). Modelling of the BK16 diamond value in $/ct using the modelled SFD distribution would normally require the fitting of the distribution for diamond value within each size class. In this case however, there are too few stones to do this with any reliability. As such, an extrapolation model of the average within class $/ct was the approach used to derive a range of plausible values for stones that are greater in size than those observed in the sample. It must be noted that this is an aspirational method of arriving at a potential valuation and will have to be treated with due caution until enough stones have been recovered to validate or invalidate any of the projections made. Figure 2 displays three modelled lines (orange, grey and yellow) that represent three methods for extrapolation diamond value into the larger categories. These diamond values can then be applied to BK16 modelled SFD to determine the average overall diamond value in $/ct that might be possible should these values be observed. Model 1 (orange line) -- Represents a traditional conservative extrapolation of maximum observed values into upper classes in which the value of the highest observed $/ct is kept constant into the higher size fractions. This model returned an average diamond value of 298 $/ct (~70% of the value coming from extrapolation). It should be noted that this conservative method can represent an under extrapolation given that larger diamonds value in $/ct would often increase into larger size categories. Model 2 (grey line) -- Represents an incremental increase in diamond value based on the increment of value across the last few populated size classes, this proportional increment is then extended into the higher classes. This model returned an average diamond value of 453 $/ct (~80% of the value coming from extrapolation). Model 3 (yellow line) -- Represents an optimistic model based on the assortment remaining the same into the upper size classes, this assumes that the relationship between value and size is unaffected in the larger categories. This model returned an average diamond value of 792 $/ct (~84% of the value coming from extrapolation). Figure 2. Plot of average $/ct per sieve class overlain with the three extrapolated models for value in classes that have no diamonds. 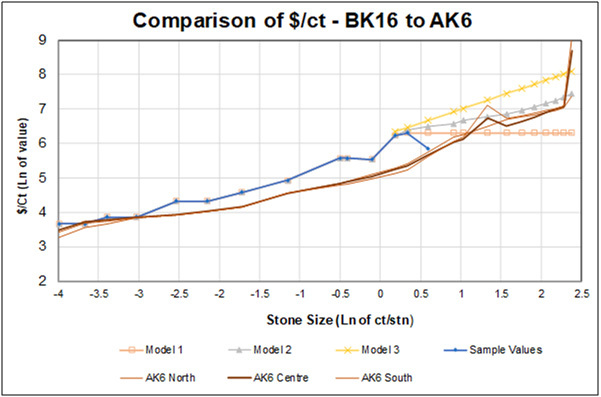 The BK16 modelled grade size distributions, can be used with the modelled diamond value $/ct to compare $/ct diamond value curves with those of AK6 (using production values), see Figure 3. The values from BK16 appear to be higher than those for Karowe in the fine size ranges. Above one carat however the $/ ct increases in slope for Karowe and has a large jump in the value of stones above 10 cts. No exceptionally large high values stones of this size have been recovered from BK16. At this stage, it is not possible to predict the shape of the value curve beyond the application of extrapolations already presented, although given the presence of Type IIa diamonds seen within the BK16 kimberlite there is the potential for a similar upside trend when larger samples are taken. Figure 3. 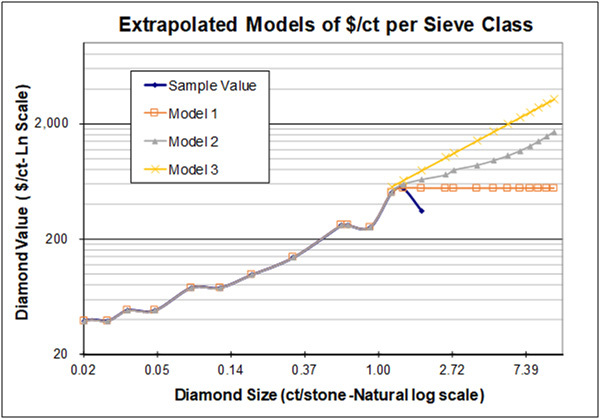 A plot of diamond value in $/ct per sieve class vs stone size, comparing the models developed for BK16 vs the production $/ct/sieve class data for AK6. These approaches and BK16 SFD models were used to generate a plausible envelope for the BK16 diamond size distribution. These models were used to forward model accurate run of mine production (in-situ/global) grades and diamond value in $/ct. These extrapolated size distribution outcomes of grade and value were combined to calculate the range of potential kimberlite value in $/tonne for BK16. The results have produced feasible ranges for the variables that are required to design and optimize the ongoing evaluation strategy (Table 4). Table 4. Summary comparison of Sampled, Published and Current Study Ranges for the BK16 deposit. *The values for Karowe (AK6) are based on the Open pit Mineral Reserve Estimate as at May 2018, Nowicki, 2018. Note - the grade of AK6 has gone down over time, but the $/ct and $/tonne have steadily increased over time as evidence and thus confidence has increased in the large high-quality component of their diamond population. These modelled values have been derived from a combination of real data and extrapolation and should be considered as aspirational targets. Given the demonstrated spatial continuity in grade, future sampling should focus on acquisition of larger samples to demonstrate both the coarse size distribution and to produce a large enough parcel of diamonds to demonstrate that the diamond quality observed in smaller size fractions continues into the large diamond sizes. Links to the reports and presentations prepared by Mr. Coward pertaining to this SFD modelling study of BK16 can be found on the following link http://www.tsodiloresources.com/s/Diamond.asp?ReportID=844024. The tonnages produced for the BK16 kimberlite units are based on the volumes from updated modelling and an updated set of density core measurements of these two units down to a level of 450 meters below surface. The lower Exploration Target tonnage of 18.2 Mt presented is based on the modelled volume and converted to tonnage using the lower average weathered kimberlite density of 2.29 g/cm3. The upper Exploration Target tonnage of 20.1 Mt presented here is based on the modelled volume and converted to tonnage using the higher average fresher kimberlite density of 2.53 g/cm3. This exploration target and the references made to tonnage of the BK16 deposit are conceptual in nature, and at present time there has been insufficient exploration to define a mineral resource and it is uncertain if further exploration will result in the target being delineated as a mineral resource. Due to the costs associated with bulk sampling, the Company has entered into confidentiality agreements with several firms and entities which have indicated an interest in entering into a transaction via a purchase of an interest in BK16; a joint venture; or a marketing agreement for BK16 diamonds. Discussions are still at a preliminary stage and there is no certainty a transaction will be concluded. Davy, A.T., 1989. The Size Distributions of Diamonds in Kimberlites and Lamproites. PhD Thesis, Imperial College London. Ferreira, J.J., 2013. Sampling and estimation of diamond content in kimberlite based on microdiamonds. PhD Thésis, Ecole De Mines Paris p.207. Nowicki, T. E., Armstrong, J., Fourie, L. J. H., and Garlick, G. 2018. 2018 Technical Report for the Karowe Mine: Updated Mineral Resource Estimate. By Mineral Services on behalf of Lucara Diamond Corp.
Zimnisky, P., 2018. Replenishing Economic Diamond Resources, A Daunting task for Miners. Published by the Northern Miner on August 20, 2018. This press release may contain forward-looking statements. All statements, other than statements of historical fact, that address activities, events or developments that the Company believes, expects or anticipates will or may occur in the future (including, without limitation, statements pertaining to the use of proceeds, the impact of strategic partnerships and statements that describe the Company’s future plans, objectives or goals) are forward-looking statements. These forward-looking statements reflect the current expectations or beliefs of the Company based on information currently available to the Company. Forward-looking statements are subject to a number of risks and uncertainties that may cause the actual results of the Company to differ materially from those discussed in the forward-looking statements, and even if such actual results are realized or substantially realized, there can be no assurance that they will have the expected consequences to, or effects on the Company. Factors that could cause actual results or events to differ materially from current expectations include, among other things, changes in equity markets, changes in general economic conditions, market volatility, political developments in Botswana and surrounding countries, changes to regulations affecting the Company's activities, uncertainties relating to the availability and costs of financing needed in the future, exploration and development risks, the uncertainties involved in interpreting exploration results and the other risks involved in the mineral exploration business. Any forward-looking statement speaks only as of the date on which it is made and, except as may be required by applicable securities laws, the Company disclaims any intent or obligation to update any forward-looking statement, whether as a result of new information, future events or results or otherwise. Although the Company believes that the assumptions inherent in the forward-looking statements are reasonable, forward-looking statements are not a guarantee of future performance and accordingly undue reliance should not be put on such statements due to the inherent uncertainty therein.